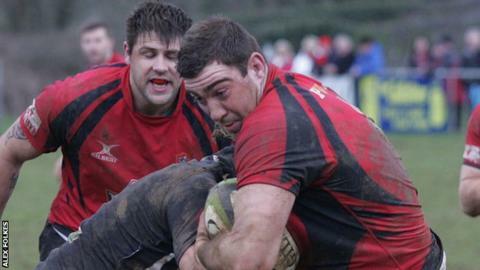 Tom Duncan scored a hat-trick as Redruth cruised to a 46-17 win over Barking in National Two South. The win over the bottom side sends the Reds second in the table, a point ahead of Henley and 11 off leaders Worthing with two games in hand. But the Reds were forced to work hard for their win after going in tied at 17-all at half time. "We showed our character, we stuck to our structure and we got the result in the end," said forward Jake Rayment. "It was a great game and we showed some character. "We knew they were going to come hard at us, even though they are bottom of the table," he added to BBC Radio Cornwall. Two tries from Duncan and one from Neal Turner helped the Reds to a 17-0 lead before two converted tries and a penalty from the visitors brought them level at the interval. But Notman and Darren Jacques scored inside the opening six minutes of the second half before Jacques got a second on the hour. The Reds got a penalty try soon after before Duncan completed his hat-trick with eight minutes left to register his 18th try of the season.